Skier Ben Sinnamon enjoys some pre-Christmas face shots. 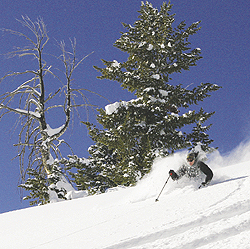 Backcountry skiers are finding good powder at higher elevations, particularly on north and northeast exposures north of Ketchum, although crusty conditions are also prevalent. Steeper slopes may be dangerous, and backcountry skiers are encouraged to check the daily avalanche forecast before venturing out. Is this the year that you'll do it?